Supply chain bottlenecks can slam the brakes on a booming economy, say economic analysts. Currently, market capacity is limited by a shortage in labor; there simply aren’t enough truck drivers on the road to move goods in sufficient quantity. However, the shipping industry is responding. Trucking firms are offering pay hikes and hiring bonuses in an effort to attract new drivers. These efforts could pay off sometime in 2019, say some experts. If they do, distribution centers need to be ready to operate as efficiently as possible to avoid becoming the next big supply chain bottleneck. Here are some changes every distribution center can make to ensure the quick flow of goods and materials throughout the supply chain. Start by optimizing order picking processes. Reporting on research from the University of Tennessee’s Global Supply Chain Institute, Industrial Engineer tells us that 54 percent of all DC labor is devoted to order picking, the largest portion of any task in the industry. Therefore, improvements in order picking efficiency will have an outsized effect on total DC productivity. The most effective way to boost pick rate is to reduce travel time. There are engineering solutions, such as adding 45-degree aisles that allow pickers to take a more direct route through the facility. But even simple improvements, such as providing higher-capacity Order Picking Carts, can reduce the number of trips required for each pick, thereby cutting overall travel time to the absolute minimum. Eliminate congestion in the receiving area. The best picking systems in the world won’t improve productivity if SKUs pile up in the receiving room. 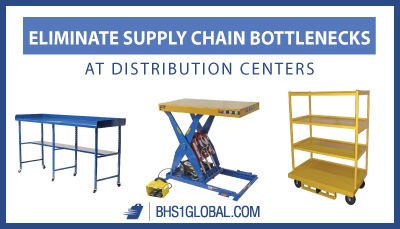 Efficient distribution centers must ensure that products can move quickly and accurately from the dock to racks. Advanced shipment notice (ASN) systems are the gold standard for improving receiving at distribution centers. Ergonomics is primarily a safety issue, but this study of how work fits the worker’s body also has a big impact on productivity. Workplace injuries deplete the workforce and could even lead to costly fines and settlements. Meanwhile, if a certain workplace task increases the risk of developing a musculoskeletal injury, it probably isn’t comfortable to perform, and employees are likely to move slowly. A few simple changes can drastically improve ergonomics in the distribution center. Consider providing Adjustable Packing Desks or Lift Tables as adjustable-height workstations. These tabletops move to fit the worker, preventing risky bending, reaching, and twisting. The good news is that labor shortages in the shipping industry won’t last forever. Now is the perfect time for distribution centers to improve productivity. After all, when the demand for truck drivers starts to match the market’s demands, shipping firms will inevitably favor DCs with the shortest wait-times at the dock. No one wants distribution centers to become the next big supply chain bottleneck. Ashe, Are. “US truck shippers prep for higher 2019 spending.” JOC. IHS Markit, 30 Aug. 2018. Web. 18 Sept. 2018. Dittmann, Paul. “11 Ways to Optimize Your Warehouse.” Industrial Engineer: IE, vol. 48, no. 2, Feb. 2016, p. 44. EBSCOhost. 18 Sept. 2018. Long, Heather. “America has a massive truck driver shortage. Here’s why few want an $80,000 job.” WashingtonPost. The Washington Post, 28 May 2018. Web. 18 Sept. 2018. Long, Heather. “America’s severe trucker shortage could undermine the prosperous economy.” WashingtonPost. The Washington Post, 28 June 2018.